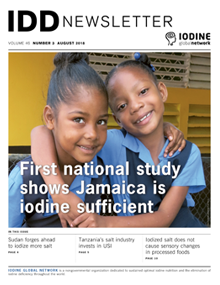 In January this year, the Iodine Global Network and the Swiss Federal Institute of Technology (ETH) Zurich, in partnership with the Ministry of Health and the Ministry of Education, the Pan American Health Organization (PAHO), UNICEF, and The University of the West Indies, completed the first national iodine survey in Jamaica to determine the iodine status of the population. In July, IGN Regional Coordinator for MENA/EMR, Dr. Izzeldin Hussein, travelled to Khartoum to follow up with the state Minister of Industry, Dr. Abdu Daud Suliman, and conduct a rapid assessment to verify whether the newly iodized salt is reaching retail outlets and households. In August 2018, Dr. Vincent Assey and a team of iodine stakeholders including Nutrition International (NI), Global Alliance for Improved Nutrition (GAIN), UNICEF, Ministry of Minerals, Tanzania Bureau of Standards, and Tanzania Food and Nutrition Centre, visited Neelkanth Salt Ltd and met with its Marketing Manager Mr. Shakher Srivastava. Building on the momentum generated by the 2015 Global Summit on Food Fortification in Arusha, the Government of Tanzania held its first-ever National Food Fortification Summit (NFF) in Dar es Salaam on 23–24th August 2017. IGN was among its co-conveners and played key facilitating and technical support roles. A survey of iodine intake during pregnancy in Montenegro was completed in 2017 thanks to UNICEF Montenegro, with the support of the USAID, the Ministry of Health and selected primary healthcare units. Some food manufacturers have expressed concern about the potential instability of iodine and changes in sensory properties of their products if iodized salt is used. To allay these concerns, a comprehensive review was conducted examining the effect of salt iodized with either potassium iodide (KI) or potassium iodate (KIO3) on processed foods. Using urine samples and dietary data from approximately one thousand pregnant women, this study investigated the women’s iodine status (UIC), and assessed if maternal characteristics and dietary factors may influence the iodine status. A cross-sectional Fortification Assessment Coverage Toolkit (FACT) survey was implemented between October and December 2017 by the Ministry of Planning, Development and Reform Pakistan, the Global Alliance for Improved Nutrition (GAIN) and Oxford Policy Management (OPM). Israel has not had an IDD prevention program, neither a universal salt iodization (USI) nor a urinary iodine monitoring program. According to the Israeli Water Authority, 80% of the drinking water in Israel presently comes from iodine-depleted (non-detectable or  1  g/L) desalinated sea water. The 2018 World Salt Symposium (WSS) was held in Park City, Utah, USA on June 19-21, bringing together salt producers, researchers, journalists, business leaders and academics from more than 30 countries. The Iodine Global Network in partnership with Kiwanis International hosted technical sessions on iodine nutrition.